In a continuing partnership between The Dulwich Centre in Adelaide and The Department of Social Work, the third cohort of students from the Master of Narrative Therapy and Community Work (MNTCW) graduated at a ceremony held at The University of Melbourne on 18th March, 2017. The course draws students from around the world and has also had a strong uptake from Indigenous students. 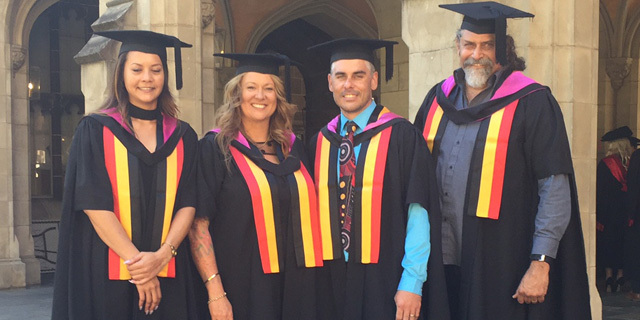 For the first time four Indigenous students graduated from the course with First Class Honours and three of this group will be going on to do a PhD at the University of Melbourne. As further recognition, the four students Anthony Newcastle, Vanessa Davis, Justin Butler and Kylie Dowse presented the student Valedictory Address at the graduation ceremony. Congratulations to these students on their exceptional achievements and to all the graduating class of the 2016 MNTCW!